It’s officially December, and thus my #AcWriMo binge writing adventure has (finally) come to an end. As I mentioned in my last post, one of the things I like best about #AcWriMo is the public accountability part of it. The extra motivation of declaring a stretch goal and posting about how well you meet that goal is an important part of the process. I also think it’s useful to take stock of significant writing activity–think through the process and reflect on what went well and what went not-so-well. This post is about both of those things. 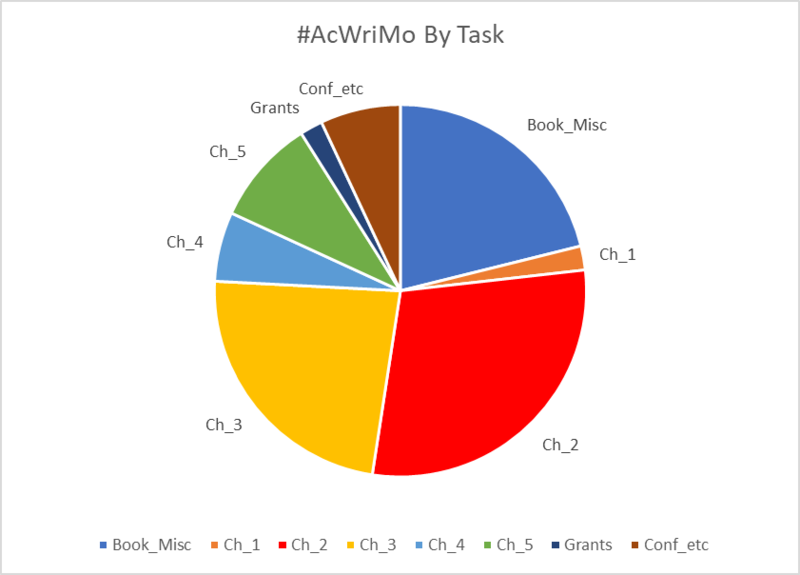 During my #AcWriMo binge session, I managed to write 36,898 words. That’s a lot of words, and I feel really good about it. But, as cool as that is, I didn’t manage to meet my more important goal of having a complete draft of the book. First: It turns out Chapter 2 is going to be a lot longer than I thought (14,000 words – sorry in advance, future readers). Second: I wrote a fair bit of non-book things, mainly because deadlines. Third: I wrote a lot of words that didn’t make the final cut. There are 12,146 words in my “graveyard” — that supplementary word doc where discarded text goes in hopes of eventual zombification. Some of those are words that I’d written before that got cut through re-writing, but a good chunk of them are part of my #AcWriMo 36,898. So- note to self: I gotta write 40,000-45,000 words to end up with 30,000.